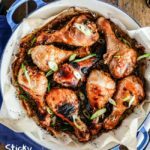 Sticky honey soy chicken drumsticks are super easy and deliciously saucy chicken legs baked in the oven. These drumsticks go well on their own or over steamed rice. Whatever the occasion maybe they will become your family’s favourite instantly! 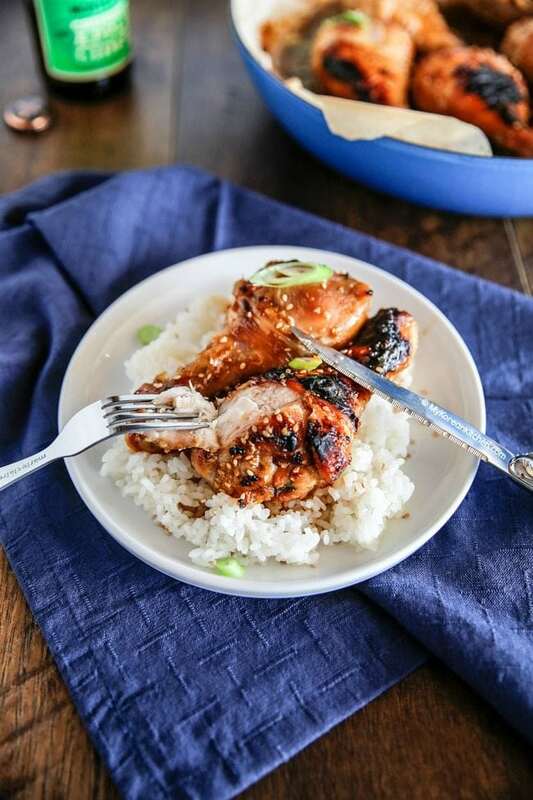 When I shared my oven baked Korean chicken wings recipe the few months ago, it got popular immediately. A few of my readers made it and shared their photos the very next day! What a response, right? I really love seeing and reading your feedback! Anyway, they all said they really enjoyed it. 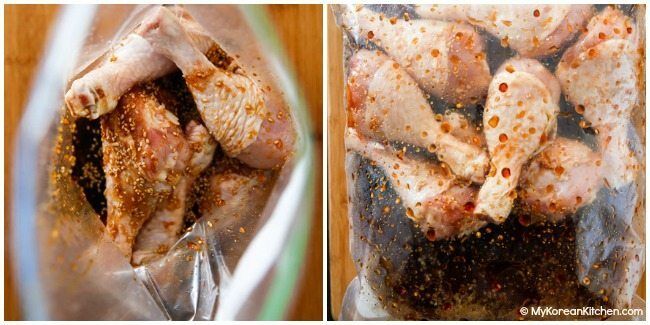 Though a lot of people preferred using drumsticks over chicken wings because they have more meat on them. Interesting! Which one do you prefer? She particularly loves the novelty of holding the drumstick in her little hand and devouring it as fast as she can. I love watching her doing that! So adorable. 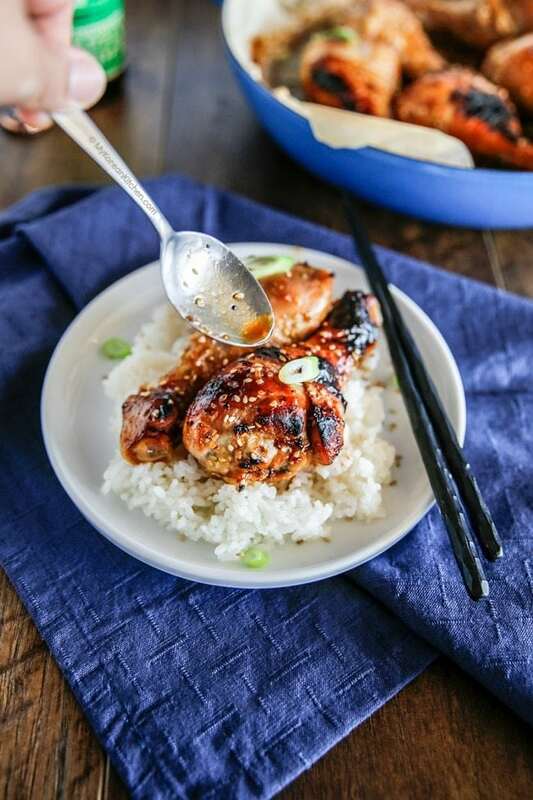 Sticky honey soy chicken drumsticks can be cooked in two different ways. 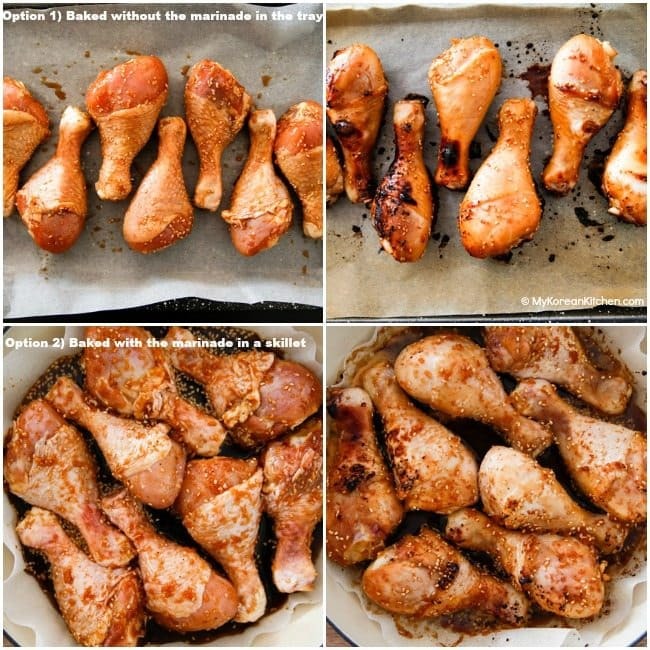 One way is baking the, straight on a baking sheet without any liquid (marinade) on them. The other way is cooking them in a skillet with liquid (marinade) on them. Obviously, the results are different. I found that the former method results in stickier texture than the latter. It also tends to leave a more charred mark on the skin as well. 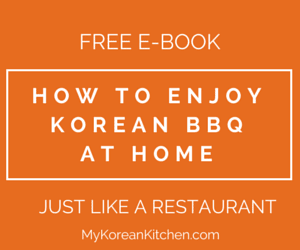 But if you cook with the marinade, then you can use the sauce to glaze over the chicken and steamed rice! 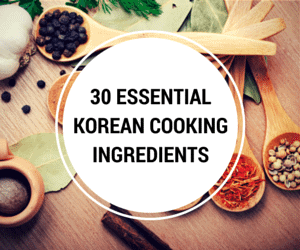 It’s quite a nice way to make an easy and tasty meal! 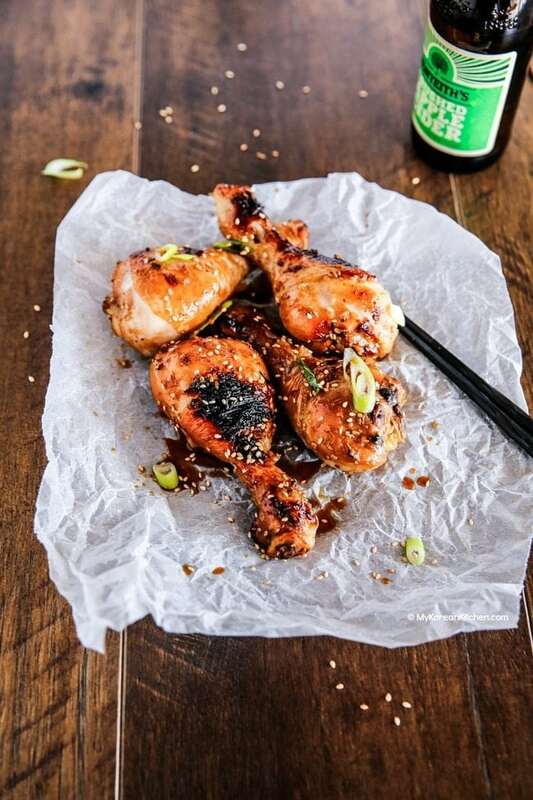 These sticky honey soy chicken drumsticks are another perfect recipe for chicken lovers. It’s sweet salty savoury goodness! It will be perfect as a meal or a crowd-pleasing appetiser depending how you would like to present it. Enjoy! 3. Put the tray / pot into the oven and bake it at 240 C/ 464 F for 12 mins. Take the tray/pot out and turn the chicken over and put it back into the oven. Bake it a further 12 mins or until the chicken is fully cooked. Garnish with the sesame seeds and green onion. Serve. Put the tray/pot into the oven and bake it at 240 C/ 464 F for 12 mins. Take the tray/pot out and turn the chicken over and put it back into the oven. Bake it a further 12 mins or until the chicken is fully cooked. Garnish with the sesame seeds and green onion. Serve. When cooking in a pot in the oven, do you cover the pot? Does this work as a freezer meal? Does the sauce freeze/thaw ok? My son LOVES this recipe! 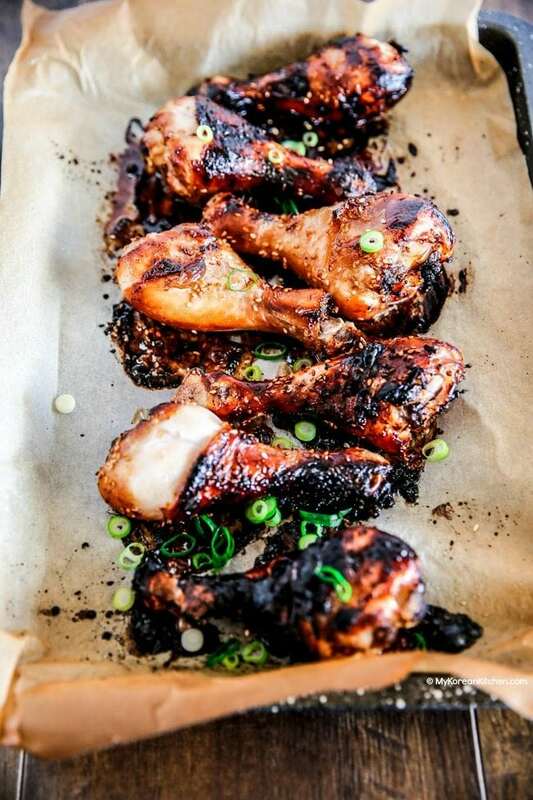 He asks for these honey soy drumsticks nearly every week. Thanks for a delicious, simple, kid-friendly recipe! Good to hear Casey! I make this nearly every week as well. 🙂 So easy and delicious! Hi Sue! Looks delicious…. want to make it but I don’t have Mirin. What is a good substitute? I have rice wine vinegar would that do? Hi Susie, If you have other types of leftover alcohol (e.g. white wine), you can use those instead. Hi, do you think I could make this with porch chops instead? Just made them. My eight year old son who is usually very skeptical about anything new wolfed down three and asked for them again. Thanks for sharing the recipe. Any advice for making these in an Instapot? Hi Wendy, I don’t own instapot, so I have no idea. Hopefully, somebody else can answer your question. Fantastic. The kids loved it, too. Will be added to our list of favorites! Oh thank you so much!! I love it too. Good Blog Post.. thank you so much for sharing this..! Hi Sue, I tried it with thighs and just lowered the temp to about 180°C for the 2nd half of about 45min time in the oven. 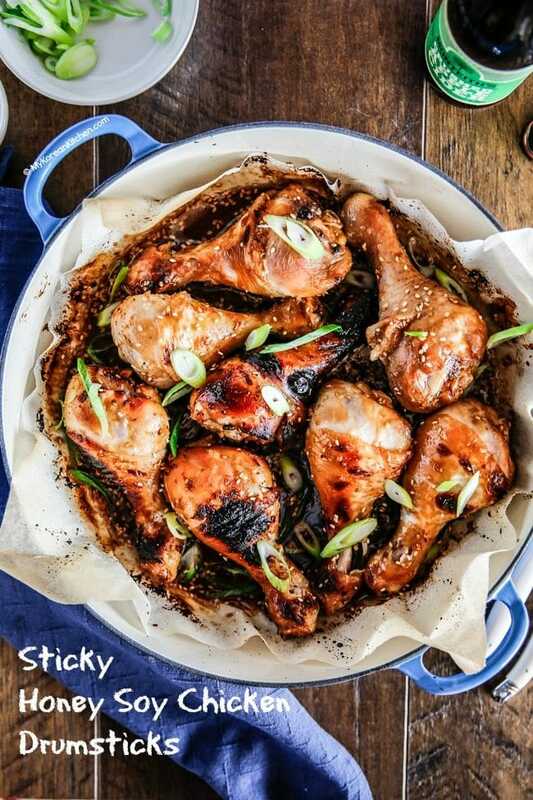 My boys love sticky chicken recipes, we shall definitely be giving this one a try. Yum! 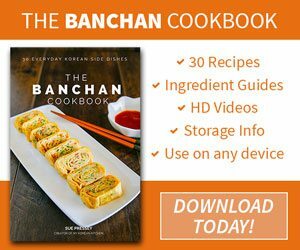 I have made your recipe twice with chicken thighs and doubled the batches and they are absolutely amazing thank you so much for the recipe! I added a bit more sesame seed and cooked the chicken on the grill. Very, very tasty! I was going to let the chicken cool and put some in the refrigerator for later, but it never had a chance. Next time, I double the batch! I tried this sticky chicken recipe. Which type of soya sauce do you use? Wondering if it is the same as chinese soya sauce. As the color of the cooked chicken looks darker. Hi Joseph, Everything on my website is working fine as far as I can test. If you’re browsing with your mobile device, it could be that you scrolled down too fast? There’s a button you need to press to view the whole post. (It’s only applicable on a mobile device) Is this the case? Can you substitute breast for drumsticks. It’s the only thing on yardbird she eats. And I love your site.